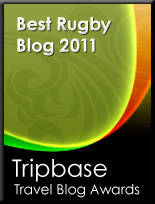 TOTAL FLANKER...a rugby blog: The Best Rugby Player You Never Saw? Many moons ago I read a book. It was blue. The title of this blue book was "The Greatest Footballer You Never Saw" and tells the story of Robin Friday, an exceptional footballer (of the round ball variety) who really should have played for England in the 1970s but never did. Why? Because Friday refused to take life seriously, lived every moment as if it were his last and ultimately destroyed himself, tragically dying at the the age of 38 without ever having fulfilled his potential after years of alcohol and drug abuse. Instead of gracing the pitches of Old Trafford and Anfield, Friday played for the likes of non-league Hayes Town and Reading and Cardiff of the old fourth and second divisions respectively. I recall it being an excellent read and, spotting the book again on the bookshelf this weekend, it got me thinking as to whether there might be a rugby equivalent, a player of huge talent whose maverick or self-destructive nature meant that his potential was never fulfilled? It's difficult to draw an exact analogy, but I suppose that in the professional era the likes of Messrs Church & Brook (aka Gavin Henson and Danny Cipriani) spring to mind. Whilst it can be said that neither have truly yet fulfilled their potential, it's difficult to draw justifiable parallels with the career of Robin Friday. Both have, after all, played for their country while Henson does have a couple of Grand Slams and a Lions tour to his name and the Cipriani story is, you feel, far from finished. Their off-field activities are hardly in the same league either. No, to compare effectively you'd need to come up with someone who clearly had the talent to go far but whose off field behaviour destroyed his rugby career. Although I can perhaps think of one or two players I've played the game with whose fondness for sherbet meant that they didn't perhaps achieve what they might have done, there's certainly nothing on the same scale as the Friday story. Certainly in the professional era we are unlikely to unearth any likely candidates given the physic al demands placed on players today, but delving back into into my cluttered memories of the amateur era there must have been a few who might qualify. There were, for instance, a number of players during the 70s and 80s who made only very fleeting appearances for England, although admittedly this was probably more down to playing and selectorial incompetence than to standards of behaviour. 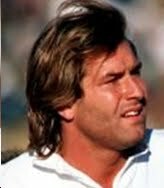 Being a backrow aficionado, one player who did catch my eye in the mid-eighties was Quins number 8 Chris Butcher who won 3 caps for England in 1984 and looked the real deal before seemingly disappearing off the face of the planet. I can find very little information about him on t'interweb but I'm sure I read somewhere that he liked a bevvy or several and that there may have been an incident involving a wet fish and an England selector's wife, but my memory might well be playing tricks on me and if so I must humbly apologise if I've maligned the poor chap. Yeah Rupeni Caucaunibuca was an incredible winger, but his penchant for relaxing with a fat spliff seems to have gone down badly with the Fijian rugby authorities. I don't think he's played for his country since the 2007 World Cup, although he did pretty well playing for Agen in the Top 14 (top try scorer two years running). He was clearly overweight then too: watching highlights of the games is scary, looks like a prop with the pace of Habana. My dad always used to say Chris Butcher was the best rugby player f all times.